The Gypsy Journal Rally is hosted and produced by Nick and Terry Russell, a fulltime RVing couple with a large following due to their RV Travel Newspaper, and Nick’s popular RVing Blog. Make sure to watch our Gabbing with the Geeks where we interview Nick and Terry. The Escapade is what they call the annual rally of the Escapees RV Club. This was a special celebration for the 50th Escapade. It was a great week, and we taught 3 seminars. Check out the Faculty page. From September 25 thru October 3 we will be *offline*! We are gathering with family and flying to Seattle to take a cruise on Alaska’s inside passage. We’ve heard that there will be some Wi-Fi available on board, but we are going to do our best to ignore that! We apologize in advance for any inconvenience this may cause … we will be back in the electronic saddle on October 4. Our new website and forum are both humming along. We’ve ironed out most of the kinks. Make sure to check out the forum, there is quite a lot of discussion in particular in our Droid forum. Anyone can see the posts, only members can ask questions. Note: if you are a current, paid member on the old site, your membership has been migrated with your same username and password, and you should have received an introductory email from us. If not, please contact us … but don’t expect an answer till after our cruise! Picasa tip: Picasa, I Love You … Now Change! In this month’s newsletter, we’ll be focusing on Facebook. So many people are using it, and so many people have misconceptions about what Facebook is. We thought we’d give you our take on the subject. Facebook isn’t like anything else. Although you can post stories on it about your life – like a Blog – it’s not a blog. We don’t refer to it as a photo sharing site, even though more photos are shared on Facebook than any other photo-sharing site. It’s also not a forum, or a community, although Facebook enables many communities of people to discuss issues of interest to them. Some people are using Facebook as their primary means of communication rather than email. And some companies are using Facebook as their primary website these days, but nobody would call Facebook a webhost. So, what *is* it? Well, it’s all of those things. Which is why it’s so hard to describe. First and foremost, Facebook is a directory of people, real people. It started at Harvard University as a way to put the Harvard ‘Face Book’ online. Like a yearbook, this is a place where you could go to see the picture, along with names and other ‘profile’ information, of everyone at school. From Harvard it grew to other Universities, then to High Schools, then to adults, then to the world. Over half a billion (yes, with a B!) people worldwide now (September 2010) have a profile on Facebook. When it was a simple directory of university students (back in 2003-4), you had to prove you were a student at a participating university, and you were only allowed to see the profiles of other students at your same university. Once it spread beyond those ivy-covered walls, the folks at Facebook programmed in the concept of friends. If you verified that another Facebook user was a friend of yours, then both you and your friend could see each others information. Although it is possible today to set your Facebook privacy settings so that anyone can see your information, that is not recommended, and most users only share with confirmed friends. Facebook did not stay a simple directory for long. Once friends knew that they could find other friends on Facebook – they wanted to communicate at the same time. So, Facebook created a way to send messages. Then, they created a way that you could just type ‘status updates’ (think of mini-blog entries) and that those updates would automatically be distributed to all your friends. Wow! How efficient. So, for example, when we left for our Alaska cruise, I just posted that information on Facebook, and all my friends got the information. No need to call, no need to email, I didn’t even have to write a post on our blog – but I did because not all our friends are on Facebook, and many still read the blog. Now think about it from the other side. I am also receiving all the status updates from all of my friends. It’s called the ‘News Feed’ and it is the first thing you see when you log into Facebook. The News Feed is your home page. You can always get back to it by clicking ‘Home’ in the upper right corner. Facebook may be a directory of half a billion people, but the experience for each individual is only about you and your friends. When my friend Melinda posted a photo of her new granddaughter in New Zealand, I saw it on my News Feed. When my friend Eric posted that he was in Poughkeepsie, NY, I responded with a comment that we would be traveling thru that area the next week. Because of Facebook, we were able to get together when we hadn’t seen each other in years. When some RVing friends posted that they were headed north from Oregon to Washington, I was able to tell them of our favorite campground in the area. When other RVing friends wrote of a great restaurant in a city we were planning to visit, I made a note of it. All the above examples could have been communicated with emails or blogs, but it’s SO much faster and easier with Facebook. There would have been no reason for Eric to email me his whereabouts. Just by friends jotting down a few notes about what is going on in their lives – the whole group of friends can keep in touch and benefit from the conversation. The experience is similar to friends who get together at the local pub, or the community center, or church. It’s a social gathering, a social network. Because it’s on the web rather than the physical world, it’s always available, all over the world. That is a powerful communication tool! Facebook represents the next step in the natural progression of communication. As information continues to explode, we need better and faster ways of accessing and filtering the information we want. In addition to your friends’ updates, Facebook now allows you to ‘Like’ businesses or groups and add them to your News Feed. In essence, you can create your own customized newspaper online. You will receive stories from your friends, your organizations, businesses you like, and groups you like, For example, I ‘Like’ Ted.com. No – actually I Love Ted.com! Their video talks on ‘Ideas worth spreading’ are so inspiring … but I seldom remember to visit www.Ted.com to watch them. I have now added them to my News Feed so I am alerted every time they release a new video. The more I use Facebook, the more I like it. I find myself looking at my Facebook Home page (my News Feed) several times a day. It only takes a few seconds to feel caught up with all the people and news that I care about. The more of my friends that are on Facebook and the more groups and businesses that I ‘Like’, the more complete is my News Feed and the less I need other forms of communication or information gathering. you *need* to be on Facebook! Think about it, if millions of people are getting their news, advice, and information from their Facebook News Feed, then your business needs to be there! You need to find some way of posting informative stories that will be of value to your customers. Your customers are in complete control of what is included in their News Feeds – unlike the days of Newspaper and Television. So, you need to give them something of value to keep their attention. If you do, people will ‘Like’ your business. Anything one person ‘Likes’ gets published out to all of that person’s friends. What do we call that? A referral! The best kind of advertising that no amount of money can buy. And, how much does it cost? Nothing! I just finished reading the book ‘The Facebook Effect’ by David Kirkpatrick. I couldn’t put it down. Actually I read it out loud as Jim drove our RV across the country. It was the perfect driving entertainment for these Geeks on Tour! If you like business stories about college dropouts that become billionaires – you can’t get any better than this. Mark Zuckerberg is the founder and CEO. Facebook started in his dorm room at Harvard. Within a year it became quite clear that dropping out was the smart thing to do! He was 20 years old and venture capitalists were begging him to take their money. 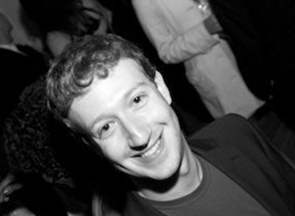 He reportedly turned down 800 million to sell Facebook when he was just 22. Zuckerberg is an idealistic young man and he has more plans for what he wants Facebook to become. He remains CEO of the company, owns the majority of stock, and is in control of the Board of Directors. He is listed as the 35th richest person in the world by Forbes. Today, on Oprah, he announced a gift to the Newark, New Jersey School system of 100 million dollars. He is 26 years old. Facebook has become the number two Internet company, only surpassed by Google in number of users. Facebook requires that you use your real name. This is not a service where you can set up multiple accounts with multiple usernames. This is a tool which enables real people to communicate more effectively. Facebook is helping to create a Global Village and, just like small town cultures, it hopes this openness fosters responsibility and accountability amongst peoples of the world. It’s certainly an ambitious goal, but I, for one, applaud the effort. We’re still working to understand it ourselves! We’ve been using it pretty heavily for a while now and are starting to get a handle on how it works. Especially since Jim and I got our Droid cellphones! Facebook comes as a built in application on the Droid, making checking our News Feed, uploading pictures, and updating our status SO easy that we’re relying on Facebook more and more as our communication tool of choice. At most every seminar we taught this summer, we would ask for a raise of hands showing how many people used Facebook. At least half the audience would always raise their hands! So, I think Facebook is definitely on our short list of topics to add to our Geeks on Tour Learning Library. Only approve friends who you actually know. Quantity of friends is not the goal. Your news feed will be oh so much more valuable to you if it comes from your real friends. If your news feed is getting cluttered with notices you don’t want, you don’t have to UNfriend the person sending them, you can Hide just that category of stories. I used to get waaay too many items about people playing Farmville, for example – now I don’t because I found the ‘Hide’ button … the X at the right of any item in your feed … click it and then you have the choice to Hide anything posted by that person, or just the Farmville stuff. Perfect. Check your privacy settings. Click on Account in the upper right corner, choose ‘Privacy Settings.’ Facebook gives you control over exactly what others can see. For example, I allow Everyone to see my status updates and photos. Most people don’t. But, I don’t allow anyone to see my birthdate. There are several options … you can learn more on Facebook’s Privacy Help Page. We’ve added a Facebook forum to our Geeks on Tour forums, so our members can continue to learn. Learn more about Facebook … on Facebook … click on ‘Account’ in the upper right corner, then Help Center. Let us know what you think by browsing over to our business Facebook page at www.facebook.com/geeksontour and leave a comment. The Geeks on Tour website is an online learning library for Travelers who want to learn to use their computers for managing digital photos, making blogs, using maps and other online resources. Anyone can watch our free videos, read articles on our Computer Tips for Travelers Blog, sign up for our free monthly newsletter, or Picasa weekly tips. A small fee makes you a ‘member‘ and you can then view any of our 190+ video tutorials on these subjects. Published by MrsGeek, in Newsletter. Tagged with Facebook. I’m glad that I’ve found your geeksontour.tv web site. Thank you for sharing your talent and wholesome information with us. You are a bright light!